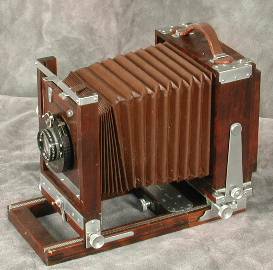 The Crown View camera was manufactured by the Folmer Graflex Corporation from 1938 to 1942. 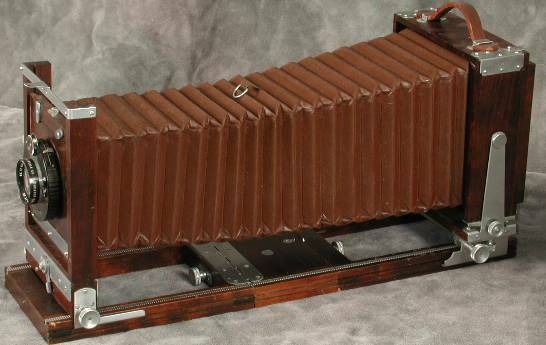 It is a classic folding wooden view camera in the tradition of the Korona. It has twin rails which provided geared movement to allow focusing with either standard. Minimum extension is 3 9/16”. An extension-rails attachment was included, and allowed 19 inches of bellows extension. 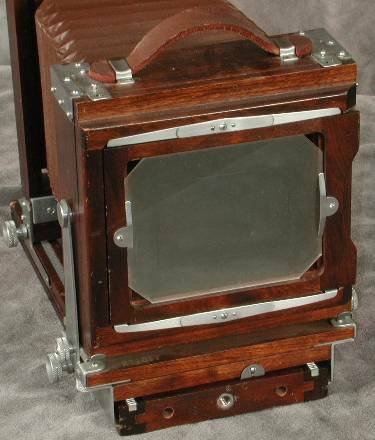 The Crown View is a pretty camera, with its reddish brown bellows and well-finished wood. The wood is accented with a choice of satin brass or satin chrome hardware. Apparently the brass version was more popular; the chrome version was slightly more expensive ($57.50 vs $63.00 in 1939) and ended production in 1941, while the brass version continued production into the following year. The movements provided in the Crown View are typical for this type of camera. It had front rise (1”) and fall (13/16”). Front shift (1 3/16”) and tilt (12 degrees) completed the movements. There were no front swings. The rear standard had only swing and tilt (both 12 degrees). These meager movements may make the Crown View camera more of a nice display piece today. It probably would fill the needs of many modern photographers, but other cameras in the same used price range provide more movements. It’s better to have it and not need it, you know. The lens board is the same as the 4"x4" board used by the pre-Pacemaker Speed Graphic 4x5 cameras (and others, including the Meridian 45B). In fact, the Graphic View and View II later used the same board. 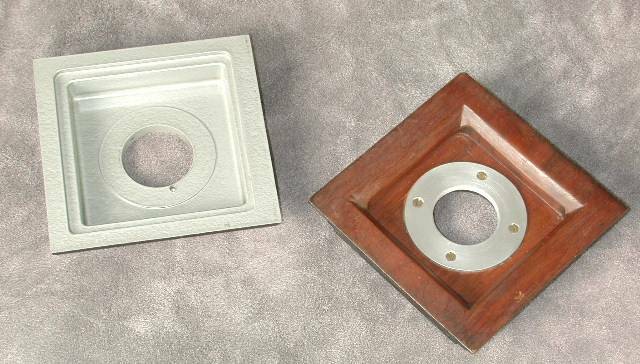 A recessed lens board (5/8”) is often seen on the used market, but it apparently was made for the View and View II cameras. It works perfectly on the Crown, and provides a little more room when photographing with that Graflex or Wollensak 3 ½” lens. 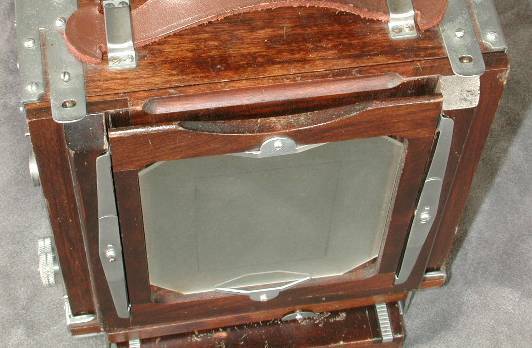 The back of the Crown View was reversible, i.e., you changed from vertical to horizontal orientation by taking the back off, turning it, and reinstalling it. The mechanism involves two little clips on the body and two pins on the back. The arrangement worked so well that Graflex used it with the Graphic View and View II. The backs are not interchangeable between the Crown View and the later cameras, but the backs on the Graphic View interchange with the View II. The backs for the camera were available in any combination of Graphic or Graflex, 4x5" or 3-1/4 x 4 1/4".